The purpose of this study was to set a benchmark for a monitoring and surveillance programme on the volumes of antimicrobials available and consumed by animals for the benefit of animal health in South Africa. This survey was collated from data available from 2002 to 2004. The authorised antimicrobials available in South Africa were firstly reviewed. The majority of available antimicrobials were registered under the Stock Remedies Act 36 1947. Secondly, volumes of antimicrobials consumed were then surveyed and it was found that the majority of consumed antimicrobials were from the macrolide and pleuromutilin classes, followed by the tetracycline class, the sulphonamide class and lastly the penicillin class. Results showed that 68.5% of the antimicrobials surveyed were administered as in-feed medications. 17.5% of the total volume of antimicrobials utilised were parenteral antimicrobials, whereas antimicrobials for water medication constituted 12% of the total and 'other' dosage forms, for example the topical and aural dosage forms, constituted 1.5% of the total. Intramammary antimicrobials represented 0.04% of the total. The surveillance systems for veterinary antimicrobials used by other countries were scrutinised and compared. It was concluded that a combination of the surveillance systems applied by Australia and the United Kingdom is the best model (with modifications) to apply to the animal health industry in South Africa. Such a surveillance system, of the volumes of veterinary antimicrobials consumed, should ideally be implemented in conjunction with a veterinary antimicrobial resistance surveillance and monitoring programme. This will generate meaningful data that will contribute to the rational administration of antimicrobials in order to preserve the efficacy of the existing antimicrobials in South Africa. This study was conducted as a survey, and collation and comparison of the volumes of the antimicrobials obtained from direct sources of information (for example the veterinary pharmaceutical companies), that were supplied and administered during the years 2002-2004 to animals in South Africa, are expressed as kg of active ingredient. The Fertilizers, Farm Feeds, Agricultural Remedies and Stock Remedies Act (Act No. 36 of 1947), administered by the National Department of Agriculture and which represent over-the-counter (OTC) stock remedies. Medicines and Related Substances Control Act (Act No. 101 of 1965) administered by the National Department of Health and for which a veterinary prescription is required. Information on the volumes of antimicrobials, manufactured and supplied for animals by the veterinary pharmaceutical industry in South Africa, were sourced from eight out of a possible twenty five veterinary pharmaceutical companies. The volume of in-feed antimicrobials sold was calculated from the figures provided by the eight pharmaceutical companies. These were compared with the estimate made by the pharmaceutical industry, which stated that 60% of feed sold for food animal consumption is medicated with antimicrobials. This information was obtained from SAAHA (South African Animal Health Association). Aindication (i.e. species of food animals and whether or not for treatment, prophylaxis or growth promotion). The volumes of sales of antimicrobials reflected in South African Rands were collected for the years 2002-2004 according to the classes of antimicrobials. Volumes of antimicrobials were calculated in kilograms of active ingredient for each particular antimicrobial class. The collected data were entered into MS Excel 2000 programmes and Microsoft Word documents. Descriptive calculations of the volumes of antimicrobials were established, for example the determination of means, standard deviations and minimum and maximum values. An attempt was made to estimate the volume of illegal importation of antimicrobials, applications for trial samples and importation of analytical samples of antimicrobials. A correction factor was obtained from information supplied by the South African Animal Health Association on the illegal importation of antimicrobials, which was estimated at 5%. The effect of the potency of the antimicrobials in the interpretation and examination of trends of antimicrobial consumption was also given consideration. The relative potency of antimicrobials can be deduced through a unit called the Defined Daily Dose in Animals (DDDanimal).12,13 The definition of this unit is the assumed average dose per day for a drug administered for its main indication in each adult animal species. This unit serves as a tool for presenting drug utilisation statistics. Within the context of this specific study, clarification needed to be sought on the calculation of the defined daily dosage per species of food animal in South Africa, as the data obtained were not complete enough to calculate this measurement. Exemption was granted by the Animal Use and Care Committee (AUCC) in August 2005 since this was a survey and no animals were involved. The reference number is S 406/04. No risk to the subjects or sources of information was involved in the process of this research, therefore, any potential physical, psychological or disclosure hazards are not relevant. The main author undertook, in writing, to maintain the confidentiality of all information supplied by the various sources. The knowledge about the volumes of use of antimicrobials, and proposed surveillance systems for antimicrobial use, is of benefit to the animal health industry in South Africa. Such information contributes to the prudent and rational use of antimicrobials to ensure the efficacy of existing antimicrobials in both animal health and the human medical field. Participation in this study was voluntary and sources were entitled to withdraw information within two calendar weeks of supplying the data. Informed consent by the sources was confirmed by the persons responsible signing and dating the completed survey questionnaire form on behalf of the respective information source. The main author ensured that information supplied by the various sources was kept strictly confidential. This was achieved by assigning electronic passwords, known only to the author of the completed questionnaire documents, and maintaining this data on a flash drive kept in a secure place. All hard copies of this information were archived by the main author and stored in facilities to which only the author had access. A total of 234 registered antimicrobials were available for food animals. The majority of registered antimicrobials (72%) were stock remedies as registered through Act 36 of 1947 as opposed to the antimicrobials registered in terms of Act 101 of 1965 (28%). In total, 64 in-feed antimicrobials were registered as stock remedies (38% of registered stock remedies) and 5 in-feed premixes were registered as veterinary medicines. 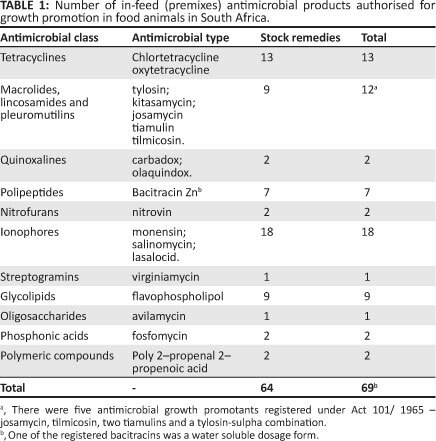 Table 1 indicates the number of in-feed antimicrobials authorised as growth promotants in food animals in South Africa. The mean antimicrobial sales for the three year period, was 1 538 443 kg of active ingredient. It was found that the majority of consumed antimicrobials were, firstly, from the classes of macrolides and pleuromutilins, followed, secondly, by the tetracycline class, thirdly, by the sulphonamide group and, fourthly, the penicillins. 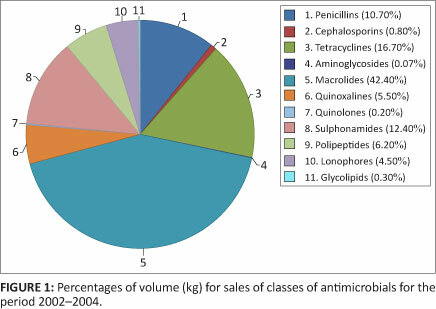 The percentages of volume (kg) of sales of antimicrobials for the period 2002-2004 are indicated in Figure 1. A total of 1 054 177 kg of the antimicrobials were sold as in-feed medications for the three years under review, representing up to 68.5% of the grand total. Tylosin constituted the majority of the in-feed antimicrobials sold, at 61% of this total. Figure 2 indicates the volume of in-feed antimicrobials sold. A total of 190 400 kg or 12% of antimicrobials sold from 2002-2004, were indicated for administration through the drinking water. Sulphonamides constituted the majority of antimicrobials applied for water medication, at 95.4%. 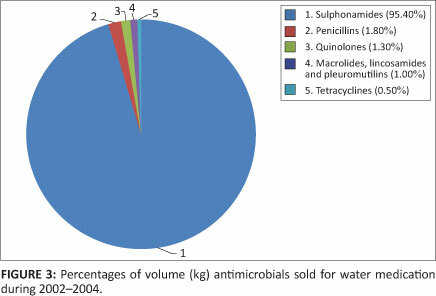 Figure 3 indicates the percentages of volume (kg) of antimicrobials sold for water medication. In all, 269 794 kg of antimicrobials were administered parenterally. This constituted 17.5% of the total dosage forms of antimicrobials utilised. Penicillins comprised the largest percentage of this volume, at 60%. 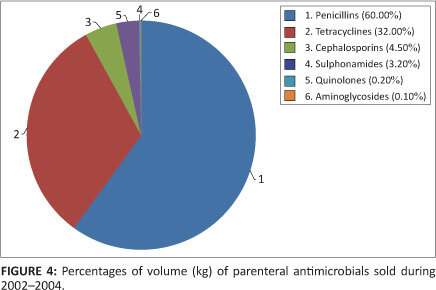 Figure 4 indicates the percentages of volume (kg) of parenteral antimicrobials consumed. Intramammary preparations were calculated at 575 kg of antimicrobials sold, and only constituted 0.04% of the total amount of antimicrobials consumed. Of these intramammaries, the greatest majority (97%) were penicillins or penicillin-dihydrostreptomycin combinations. Other dosage forms of antimicrobials available in South Africa included topical ointments, ophthalmic and aural preparations, intra-uterine pessaries and tablets. In total, 23 497 kg of these dosage forms were administered. This comprised 1.5% of the total volume of antimicrobials sold. Figure 5 shows a comparison between the percentages of various dosage forms sold. The value of sales of antimicrobials (in Rands) were obtained for the years 2002-2004 according to SAAHA's format. In comparing the values of antimicrobials consumed at this level with the volumes of sales of antimicrobials, sourced from the veterinary pharmaceutical companies, no direct correlation could be made because the statistics from SAAHA were only given in monetary value. Of the veterinary companies who specified the potency of the active ingredients, it was noted that the potency remained the same throughout the three years under review. Therefore the volumes of antimicrobials utilised increased or decreased, with potency remaining a constant. Since potency of the antimicrobial actives neither increased nor decreased in these cases, volumes of antimicrobials utilised were accepted as submitted by these companies and were not interpreted in terms of the antimicrobial potency. All information supplied by the sources was confirmed as trustworthy by the main author. The questionnaire was a standardised form to be completed and the information requirements were clearly explained to the sources. The information was checked by the main author in terms of the protocol, and any amendments to be made to the information were clearly requested from the information sources and corrected accordingly. The reliability of the information was confirmed, by one of the co-authors, by obtaining information from one of the sources which supplied the same template of data from which the same analyses and deductions could be made, as undertaken by the main author for the rest of the information. External validity: The results of this study are transferable to any other data analyst because of the consistency of the template upon which the information was requested and supplied. Internal validity: The study was undertaken in accordance with the approved protocol and the measurements were consistently taken in the same way from the information supplied. The only information that could not be measured was the information on the sales of antimicrobials sourced from SAAHA, because the statistics supplied were in monetary value as opposed to kg of active pharmaceutical ingredient. Only eight veterinary pharmaceutical companies responded to the survey. The data obtained in this survey are, therefore, unfortunately not representative of the total volume of veterinary antimicrobials consumed by food animals in South Africa during the 2002 to 2004 period. The volumes consumed by food animals were projected at considerably more than 1 538 443 kg during the three year period from 2002 to 2004. The data collected may be skewed as the pharmaceutical companies that contributed to the survey had more of certain classes and dosage forms of antimicrobials authorised for use than other pharmaceutical companies. Data also did not include antimicrobials imported under special conditions, such as Section 21 (of Act No. 101 of 1965) applications, although the latter should have been negligible. Nevertheless, this study provided useful information on trends of antimicrobial usage in food animals. The Therapeutic Goods Administration (TGA) in Australia requires that all importers of antimicrobials declare the volume of the antimicrobial, the type of antimicrobial, indicate if they are for veterinary or human application and whether they are intended for treatment or growth promotion or not. Food animal species information cannot be obtained from this permit.21 The information obtained in South Africa was based on the class, type of antimicrobial, kg active ingredient, as well as dosage form and indication for species (treatment or prevention of disease or growth promotion). A major deficiency in the data obtained from the eight companies was that it often could not be established whether or not the product had been sold for treatment or prevention of disease or growth promotion, and patterns of use at the level of food animal species also could not be ascertained. The data derived are more detailed and are consequently more useful in the surveillance systems established by the Swedish Veterinary Antimicrobial Resistance Monitoring, (SVARM), VETSTAT and the VMD. 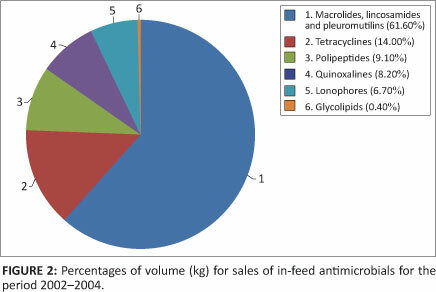 The antimicrobial groups showing the largest sales, in terms of weight, namely the macrolides and pleuromutilins (42.4% of the total volume), with reference specifically to tiamulin and tylosin, are used for the treatment and prevention of diseases such as mycoplasmosis in poultry and pigs and as growth promoters in food animals.15 Tylosin was the most extensively sold antimicrobial in this study, yet it was one of four growth promoters banned in the EU following recommendations by a World Health Organisation (WHO) meeting in Geneva, in 1997. These four growth promoters namely tylosin, spiramycin, bacitracin and virginiamycin were banned because of their structural relatedness to therapeutic antimicrobials used in humans. The extensive sales of tylosin in South Africa provide cause for great concern because its main route of administration is through the feed and at sub-therapeutic levels as a registered growth promoter. This form of administration thereby promulgates the potential for resistance to similarly related antimicrobials administered in human medicine. All registered tylosin products are available in South Africa as over-the-counter (OTC) stock remedies under Act 36 of1947 with the exception of one Act 101/1965 tylosin-sulpha combination. The second largest group of antimicrobials sold, the tetracyclines (16.7% of the total volume sold), are broad-spectrum antimicrobials, active against Mycoplasma spp. and Chlamydophila spp. and are also effective against erhlichias, rickettsias, anaplasmas and some protozoa.22 The third largest group, the sulphonamides (12.4% of the total volume), are also readily available, due to the number of products registered in terms of Act 36 of 1947, and also have a wide spectrum of antimicrobial activity.14,23,24 The antimicrobials with the fourth largest sales, the penicillins (10.7% of the volume), are mainly applied in the treatment of Gram-positive bacterial infections, and are also effective against anaerobes.25 Cephalosporins also belong to the same class of antimicrobials, the beta-lactams and are prescribed by veterinarians in South Africa for the treatment and prevention of disease. They have the same mechanism of action as the penicillins and may therefore be selected for an extended spectrum of beta-lactamase resistance. This extended spectrum of resistance has resulted in Gram-negative bacteria such as Escherichia coli strains, expressing extended-spectrum beta-lactamases (ESBLs) or plasmidic C beta-lactamases in food animals, emerging globally and has limited the treatment strategies available for bacterial infections.1,4,21 There are many analogues of the tetracyclines, sulphonamides and beta-lactams used in treating people.26 These antimicrobials are very important in human health7 and have the potential to add to the development of cross-resistance to antimicrobials administered in human health. 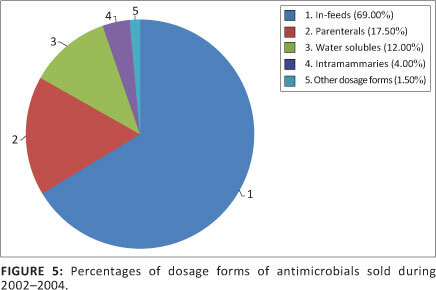 The observation, that the in-feed dosage forms constituted 68.5% of the total of antimicrobial dosage forms sold in South Africa, (with tylosin the predominant antimicrobial sold in-feed at 61% of the volume), is significant for the following reasons. There is a big difference in the way in which medicines are administered to humans and animals. In humans, treatment is directed at the individual patient, but for animals entire groups of animals may be treated with the administration of medicated feed. Moreover, as mentioned earlier, the dosages included for growth promotion are usually at low concentrations for extended time periods. Both of these practices, in combination, have the potential to accelerate the emergence of resistant bacteria in the animals concerned, that can then infect humans, through contact or via the food chain. Oxytetracycline had the second highest sales for in-feed antimicrobials at 10.7% of the volume. Oxytetracycline is well-known to result in resistant genes in bacteria, following exposure of these bacteria to low doses of this drug over an extended period of time. This resistance can develop quickly and extend from a single individual to other members of its species as well as to people living and working in that environment, through direct contact. However, it is difficult to determine the impact of in-feed application on bacterial resistance in food animals because it is simultaneously being administered for therapy and prophylaxis.28,29 Due to the concerns expressed above, antimicrobial growth promoters in South Africa should be reviewed by the regulatory authorities. These should be reviewed in order of priority, relating to the documented evidence for their ability to increase antimicrobial resistance in other groups of antimicrobials, or because of their structural relatedness to antimicrobials in human medicine. Concern is not as great for antimicrobials administered through water, as for in-feed medications, the majority of which are registered as antimicrobial growth promoters (AGPs). This is because the concentrations administered through water are adequate for the treatment or prevention of bacterial diseases, and are administered over three to seven days, as opposed to continuous administration over weeks of the animals' lifespan. It was with great difficulty that data was obtained on the volumes of antimicrobials sold by the veterinary pharmaceutical companies. The industry perceived these data to be too sensitive to divulge, but these data are essential to establish a good surveillance programme which will contribute towards the rational and prudent administration of antimicrobials. Existing legislation regulating veterinary products needs to be reviewed in order to include a mandate for annual veterinary surveillance data from the pharmaceutical companies. Alternatively, such data requirements should be included in prudent application policies for antimicrobials, and formally adopted by the relevant stakeholders in the animal health industry. It would be logical for the regulatory authorities to collect this information for future surveillance studies, as they would be responsible for establishing future policies and revising legislation for prudent antimicrobial application. Act 36 of 1936 and Act 101 of 1965 are the legal frameworks responsible for antimicrobial registration and would set the requirements specifically for registering antimicrobials, based on the collected data for antimicrobial consumption. All the relevant stakeholders, at every level in the animal health field, would be consulted on such an initiative, and industry and government would work together closely to establish feasible policies and regulations for the prudent administration of antimicrobials, before there is a mandate to do so by, for example, human health concerns and the Department of Health. In discussing the best surveillance system to administer in South Africa, concerning antimicrobials, the different types of surveillance systems available in Denmark, Sweden, United Kingdom and Australia were reviewed and compared. To establish and sustain such data systems, as found in Scandinavia, in a country like South Africa, is currently impractical as legislation controlling veterinary products is currently very fragmented. Additionally, the interests of the relevant stakeholders in animal health are very diverse, not to mention the human, financial and technical logistics of initiating and sustaining such an exercise. prophylaxis or growth promotion for each food animal species. In establishing patterns of application for each species, each company would be able to give the trade name of the antimicrobial sold, which in turn would give the authorised indications for use in South Africa and at least give some idea of patterns of application. It is of course recognised that a surveillance system is a dynamic information system that, on an ongoing basis, will need to be changed to better adapt to changing trends of antimicrobial consumption and resistance patterns. It is very important that this surveillance system, of consumption of antimicrobials, is paired with an antimicrobial resistance surveillance and monitoring programme in order to better facilitate the slowing down of resistance and the problems associated with resistance. This can be achieved by recognising trends of antimicrobial resistance and applying rational use of antimicrobials accordingly. The authors are grateful to the members of the pharmaceutical industry, government and veterinary professionals who supplied information for this study. Prof. Vinny Naidoo, of the Department of Paraclinical Sciences, is also thanked for his assistance with the statistical analysis of the results. G.S. (University of Pretoria) was responsible for the initiation of the concept and design of this study, made substantive intellectual contributions to the published dissertation, was a co-author for this article and was the promoter for the main author of this research. M.v.V. (University of Pretoria) confirmed final approval of the study protocol, assisted in obtaining data from one source of information during the study, made substantive intellectual contributions to the published dissertation, was co-author for this article and was the co-promoter for the main author of this research. H.E. (University of Pretoria) was responsible for designing the study protocol, undertaking the research and writing the manuscript. 14. Fertilizers, Farm Feeds, Agricultural Remedies and Stock Remedies Act (Act No. 36 of 1947), South Africa, Available from: Government Gazette, [statute on the internet]. c2005 [cited 2005 Feb 19] [ Links ]. 23. Medicines and Related Substances Act (Act 101 of 1965), South Africa, Available from: Government Gazette, [statute on the internet]. c2005 [cited 2005 Feb 19] [ Links ].